• Always wash new scrubs separately in cold water. Add a ½-cup of distilled white vinegar to the water before adding the scrubs. This will set the color, which helps prevent the fabric from fading. • If possible, don’t wear the scrubs to anything other than work. This means changing into the scrubs once you get to your job site. Outside elements, such as pollution, dirty the scrubs quicker. • Store your scrubs in an air tight bag when not in use. This will help protect the fabric from germs. • Avoid eating while wearing the scrubs. • When performing non-work related activities, change out of the scrubs. This will help prevent excessive wear and tear. • When handling the scrubs, always do so with care and don’t treat them like any other article of clothing. • Turn scrubs inside out before washing. Wash the garment in cold water using normal detergent. • If you notice a stain on the scrubs, treat immediately. Waiting until the stain dries will make it more difficult to remove. 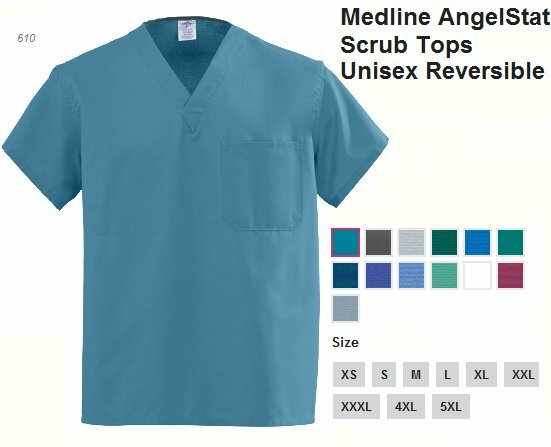 • If you need to disinfect the scrubs, wash them through two cycles to help ensure they are properly disinfected. The first cycle should be a normal washing, while the second should be done in hot water with about ¾-cup of bleach (oxygen bleach or color-safe bleach) added to the water. • For best results, follow the manufactures recommended cleaning process for each type or brand of scrub you have. The best way to ensure your scrubs look their best for as long as possible is to purchase high-quality scrubs. While these better scrubs may be a bit more expensive, they are typically made from higher quality materials, which mean they last for a longer period of time and won’t unravel as quickly as their cheaply-made counterparts do. Your scrubs are an investment and if you think of them this way, you are more likely to take better care of them.